Wheel alignment does not necessarily involve only adjusting the wheels themselves, but the suspensions as well. When repairing the alignment, the tires are fixed on angles that will allow stability while on the road. You should notice when your car needs an adjustment. In most cases, check how the tire threads wear and how stable the car keeps to the lane. Pulling to the right or left could be a sign that your wheels are misaligned. 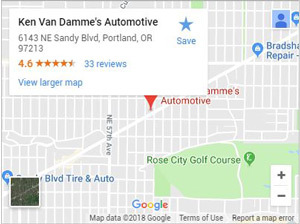 We take care of wheel alignment in Portland. As an essential part of upkeep on your vehicle, it is crucial that you get maintenance on your car at least every 6,000 miles, depending on the type of driving you do and the roads you use. In most cases, driving bad roads and hitting potholes and bumps destabilizes your wheel alignment. Unnecessary loads on the trunk is another cause. To avoid this, keep the trunk free of heavy items for everyday driving. Also check the tire pressure and ensure that you maintain the recommended amount. Too little air pressure is a possible cause of wheel misalignment. The following five reasons are critical to why you need wheel alignment done regularly on your car. When the wheel alignment is not taken care of, it may result in premature wearing on the tires. The wheels get worn out either on the inside or on the outside edges. When this happens, the camber angles of the wheels have to be adjusted to make the tires stable and to attain an even ride on the road. When the camber angles are too positive, the tire will tend to move outwards. On the other hand, if the camber angles are too negative, the tires will tend to move towards the inside. Either way, the tires will be negatively affected. You don’t want to incur untimely costs that you can easily prevent. Visit a car expert to check the camber angles for you and adjust them accordingly. If your wheels are unaligned, more often when you drive, the vehicle will tend to vibrate. The vibrations are caused by the tires trying to move in opposite directions. As stated previously, the camber angles can be different on both tires. For instance, if the front wheels have camber angles that are too positive, the vehicle will take the directions of the tires, leading to vibrations. The uneven wearing out of the tires will also result in the car taking unnecessary turns. The unbalanced wheels make control of the vehicle a problem. Steering the car to a particular stability position requires that the angles of the camber be in the appropriate measurements as directed by the manufacturer. If you’re worried that this is becoming an issue for your car, it is crucial to switch off the music systems and listen carefully to any strange movements or vibrations. On the right road, you will learn about any defects that might have occurred. Wheel alignment is vital to you as the driver, as it allows you to navigate with ease. If you notice your car moving towards one direction when you’re not steering that way, chances are you need a wheel alignment service. It is never safe to drive with wheel alignment issues on your car. Imagine ramming into an oncoming vehicle or veering off the road just because you failed to visit a car body shop for adjustment of the wheels’ stability. Any adjustment, however slight on the wheel angles, will cause the drifting of the car while on the road. The specialists advise that anytime you drive on bad terrain, be keen to observe the condition of your car steering. Wheel alignment is not a maintenance practice that anyone should skip, no matter the cost. The uneven angles can lead to more dangerous circumstances on the road. The brakes don’t work as well when the alignments are faulty. That alone is too risky to you and other road users. The suspension will also get affected when the wheel alignment is not correct. The steering systems will not be unaffected either. Managing the car will be difficult and may require more of your attention than you are used to giving. If your attention falters, it could have catastrophic consequences. A misalignment in the car wheel can cause a lot of damage to other parts of the car. As mentioned earlier, suspensions will tear when the wheels aren’t properly aligned. If the misalignment continues, the brakes will also fail at some point. The cost that you are likely to incur in the event of the failure of the brake system is exorbitant, so wheel alignment is generally an economical practice. Keeping your tires in good shape and stable will prevent unnecessary costs in the long run. Do not go to just any garage for wheel alignment. Don’t settle for shoddy maintenance practices. The effects that come with incorrect wheel alignment can be disastrous, causing accidents due to braking issues or your car veering into another lane. More damage occurs on the suspension and the braking system when the alignment is not proper. Take a road test with the mechanic to ensure that the car is not pulling to one side and that the braking is perfect. Any vibrations or unusual noise from the tires should be an indication that a better fix is needed. The safety of your drive is a factor worth considering, even if it costs you a little bit more in wheel alignment maintenance. Always drive well without hitting potholes and speed bumps unnecessarily. The more you can avoid bad roads, the better for your car and your wallet.